Amazing! Those cranes are swooping in and sweeping that field clean. Great stuff UT you captured those scenes so well, nice one! it’s more like a parachute show. Once they land, they dance. Glad you like the looks, Lloyd. 🙂 Thank you bunches! Thank you, Janis! 🙂 Glad you liked. Thank you kindly, Brian! 🙂 It’s like desolation with treats. Glad you like these, Diana. 🙂 Thank you very much! Glad you think so, Tony. 🙂 Thank you kindly! Great captures, IT! 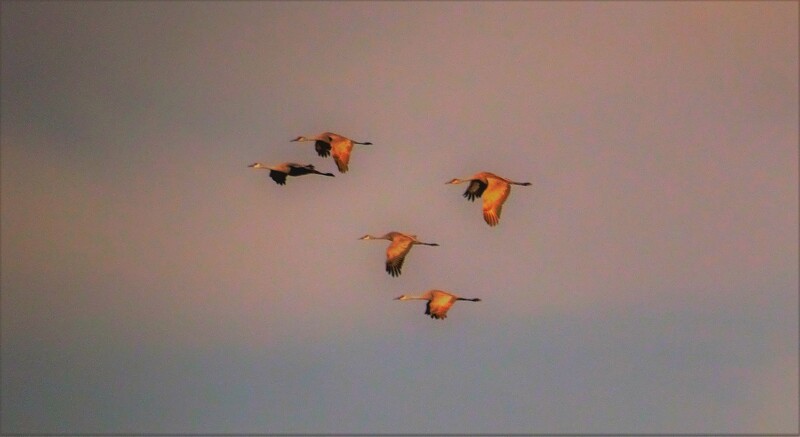 And I am amazed to learn that sandhill cranes visit your neck of the woods!! Amazing earth! What an amazing piece of the world you live in UT 🙂 Your photos show a side of life that makes it worth living and living well, thank you for sharing both the photos and wisdom of nature 🙂 Couldn’t be happier to have spring on its way. Cheers!!! Thank you much, Lorrie! 🙂 Glad you liked these shots. I took them last year. The place we go is about 90 miles from here. the Sun is shining, but the RealFeel outside is currently 19 degrees. Brrr…yuck! Thank you very much, Randall! 🙂 Good to see you again — been awhile. America is a big beautiful country with miles and miles of farmland and forest. 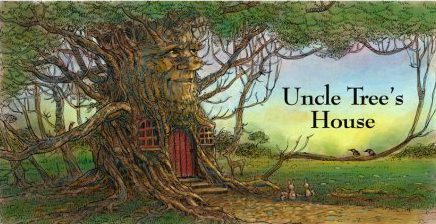 Spring will come eventually, but even Uncle Tree can be short on patience. They are beautiful. 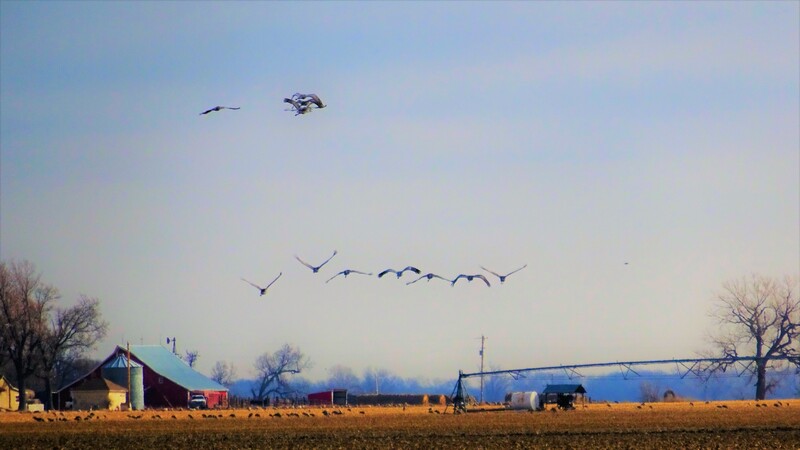 I like to watch birds flying – I am fascinated with the geese doing the takeoffs and landings, especially when they make a splash landing in the water … all big birds, but they do it with such ease. With the cranes, look at those long legs and it must seem like they are in slow motion. So slow, yet animated, they remind me of cartoons. 🙂 Goofy, but very precise. Watching them strut, dance, and flap their wings in the mid-day Sun is quite amusing. I imagine it would be something to see, like in the video … just amazing. They look so gangly with those long legs and necks, but precision in motion when flying. I know you like quotes, Linda, so I’m going to give mine away. Over the years, I used this post as a quote deposit, so to speak. I so amuse myself as I look back. There was a plethora of quotes in there Uncle Tree – thank you for sharing them with me. I did a quote every day for years – tailored it to the season, holiday or just because it struck my fancy. But none of those were my own quotes – they are not as rich as yours. The colours of your photos are spectacular. Orange slowly turning to blue these days, with yellow thrown in . Guess you’re taking us on a rainbow ride. We enjoy it immensely. Thank you very much, angelbeam! 🙂 Good to know you like my work. 😊😊😊. Your secret is safe with me…..
You are too kind, Linda. 🙂 Thank you tons! I rarely share like this, but you have a good eye, and I trust your judgement. If something you come across doesn’t make sense, feel free to ask, and I’ll try to shed some light on it. Wow… and they come back every year. I am sorry to be so late responding. Left work late, Boss called on the way home and talked to me 3/4s of an hour, late dinner, got here to write a post which seemed to take forever. Finally reading posts and it is late, but wanted you to have my full attention. I read your post twice … it was very intense and as I wrote in my comment I do believe and will say again that I think you missed your calling. It also makes me believe that I have an inadequate education as to religion … I am Catholic, but never raised Catholic, but tagged along with my pals when I was young when they went to Sunday School – I may have told you that – so I could stand to learn more things, that is for sure. Thank you for sending this post along to me. We’re going to see them again next weekend. Hope they’re still around. Please, please, don’t feel remorseful, just because some time has elapsed before you reply to any of my comments. No big deal. Sometimes, “heavy” foods take awhile to digest. Sometimes, I like to mull over possible responses, before I make them. Then again, sometimes, the next day, I wish I had commented differently. missionaries have missions, like athletes have goals. OK, I won’t fret going forward – I promise. I sometimes get a chance to hop on here during the day but have been busy at work this week as my boss was away nearly a week. I had to stop popping on WordPress in the morning as I started my day by scrambling to get out the door after lingering at my site too long. That might have worked for me years ago, but not now as it seems it sets the tone for the rest of the day. I was extremely late getting here last night. You are right – there is much involved with blogging and you’ll recall that I only interacted with two people for almost five years. No other people, save for the occasional time (very occasional). Since Thanksgiving, this has been an eye-opening experience for me to say the least. I’ve also become a little scrambled in the process and told a fellow blogger that I’ve befriended and have been e-mailing back and forth with, that I feel sometimes like I’m flying by the seat of my pants now trying to keep up with other things in my life, plus write and read here at WordPress … I am overwhelmed and have to manage my time more efficiently. Anne is retired and admits that this whole blogging experience does take up much time, and she, like you and like me, wants to take time to make a thoughtful comment or response. You have much to be proud of. You are self-taught and have a greater appreciation for what you have learned, where I, on the other hand, had to cram in many things while attending school … doesn’t mean I have retained all that knowledge. You have learned and used what you learned in measured paces … that is commendable. Thank again, Linda! 🙂 That’s nice of you to say. People blog for a wide variety of reasons. Some people don’t seem to care whether or not they get views and comments, while others get more than 500 views per post, and then have to reply to 100 or more comments. I don’t know how they do it, and I’m not sure I’d even enjoy spending that much time on “the blogging experience”. Fame has it’s price, obviously. There’s housework to do, bills to pay, groceries to fetch…yada yada yada. My girlfriend and I are leaving town for Grand Island this coming Thursday, so there’s preparations to be made and plans to make. The weather is supposed to be more Springlike by Wednesday, and around 65 degrees Thursday, and only down to 50 degrees on Friday morning. Yes, it’s been a little overwhelming to get adjusted to – it will still take a while. I don’t know how people do it either, perhaps being retired would make it easier. There is always stuff to do and I used to be much more diligent about getting things done in the house and outside. When next-door neighbor Jeff and I decided to swap our outside chores (my shoveling his walk/him mowing my lawn), I got more “me time” but it also meant I did not go out and do yard work on a regular basis and it looks like it as well. I switched to silk flowers the year after I began walking. They are “planted” in the pots, baskets or porch pots I used to use for annuals. They look very real, unless you are right up on top of them. That has made me ever more reluctant to spend a lot of time outside. I lost most of my perennials in the first Polar Vortex, and have just a handful left, plus all my roses, so still attend to them, but not as much as I should. Too much to do, too little time. Your trip sounds like a nice getaway – this is for crane viewing as well, right? Hope the weather is nice for you there. We are getting a nice warm-up starting Wednesday as well. Something to look forward to … let’s see if it lasts and doesn’t slip away again. Very cold this morning when I walked. Have a great weekend too. I love to see photos of birds in the wild! Me, too! 🙂 Thank you! 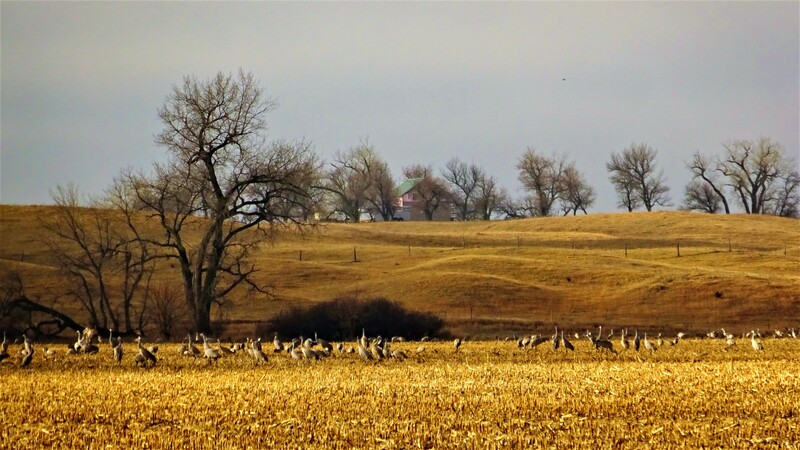 It never occurred to me that sandhill cranes lived in, wintered or passed through on their way north in Nebraska. Quite a few birds do so in northern California, especially around the Sacramento area, where I live, mostly egrets and geese. I enjoyed this immensely. Thank you. Thank you, Barbara! 🙂 Yes, on the map, the migration zone looks like an hourglass. The skinniest part is in Nebraska on a 75 mile strip of the Platte River. 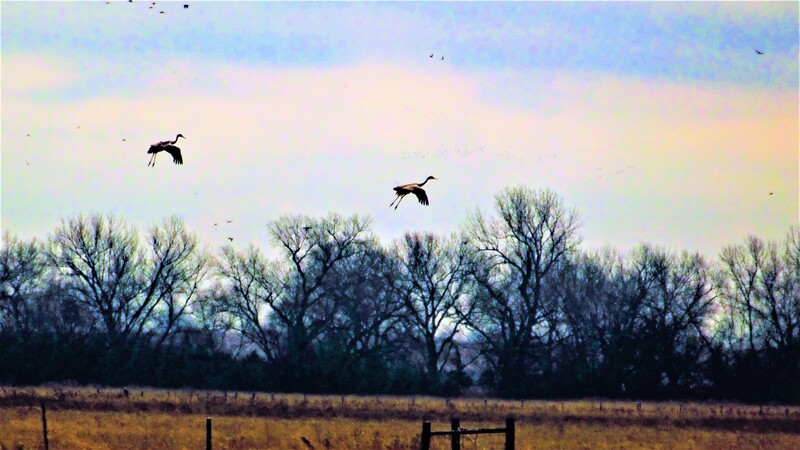 The Sandhill Cranes start flying in around Valentine’s Day, and then head north around April 15, although, there are stragglers hanging about until the first of May. We went again last week. My next few posts will just be crane crazy. 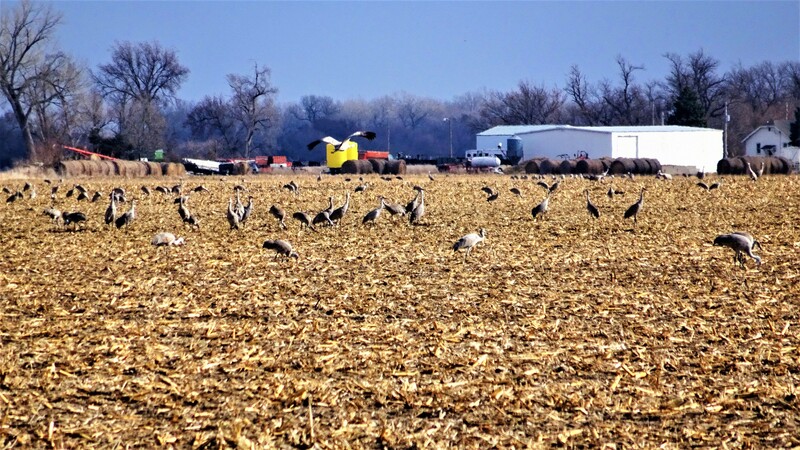 I never saw so much Sandhill Cranes, was this picture taken in youre neaborhood, and where is that…It’s incredible ! Glad you enjoyed seeing these. 🙂 Thank you very much! 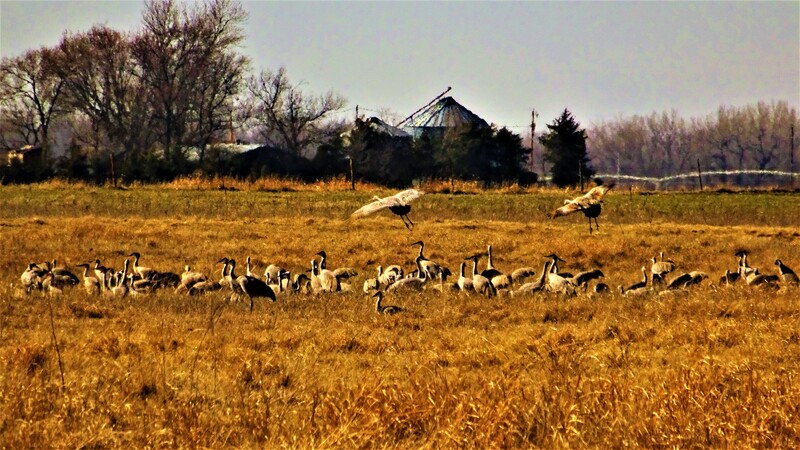 All of my Sandhill Crane shots were taken near Grand Island, Nebraska. I live in Lincoln, which is about 90 miles from there.